Action filter in MVC provides the option to handle the situations after we would really like to perform an operation before and after the execution of a controller action. For this purpose, we create a custom class, which inherits the FilterAttribute class and implements the IActionFilter interface. when creating the filter, we simply apply the class name as an attribute on the controller. Here, the FilterAttribute class makes it possible to use the class as an attribute and IActionFilter interface contains two methods named OnActionExecuting and OnActionExecuted. The OnActionExecuting is executed before the controller method is executed and OnActionExecuted is called after the execution of the controller method. This kind of technique is quite helpful for the logging purposes. Thus, let's see how we can use this filter. Let's start by adding a new class named MyActionFilter.cs. Now, derive this class from the FilterAttribute and the IActionFilter. Implement the OnActionExecuting and OnActionExecuted methods and add your custom logic into the methods.Thus, the code will look as shown below. Simply, apply the class as an attribute on the controller. Add debuggers on both the methods as well as the controller method. Run the Application and debug step by step to see the order of execution of the methods. First, the OnActionExecuting will be executed, then the controller method and finally the OnActionExecuted method. 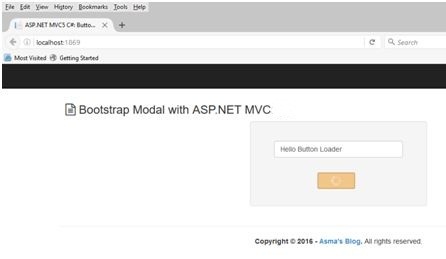 Today, I will write about Button Loader Integration in ASP.NET MVC. User interaction & responsiveness are major aspects in any application. It is always good to tell the user that is happening in the application i.e. whether they have to wait for certain processing or they can proceed with another action, etc. Today, I shall be demonstrating the integration of a simple button loader plugin called Ladda, you can explore it more by visiting the website. You can download the complete source code for this tutorial from here or you can follow step by step discussion below. The sample code is developed in Microsoft Visual Studio 2013 Ultimate. Create new MVC web project and name it "ButtonLoader". Create new controller under "Controller" folder and name it "LoaderController.cs". Open "RouteConfig.cs" file under "App_Start" folder and change the default controller to "Loader" and action to "Index" as shown below. Here, we have created a simple model for observing our loader effect. // Copyright (c) Allow to distribute this code. EnableError = true, ErrorTitle = "Error", ErrorMsg = "Something goes wrong, please try again later"
In the above code snippet, we have created a simple "HttpGet" & "HttpPost" methods to observer the behavior of the button loader. We have also placed a 5 sec delay in the post method at every response to observer the behavior of the button loader from server side as well. In the above code snippet, we have created a simple text input box and a button, for Ladda plugin to work however, you have to use following structure on button i.e. Unfortunately, Ladda plugin does not work with input type buttons. I have also combined modal here to display server response. The following piece of code will bind the button loader plugin with the button i.e. Now, execute the application. I hope it works for you! There’s a new place to put the app settings for your MVC6 ASP.NET Core application. Web.config is gone but the new solution is great, you get a dependency injected POCO with strongly typed settings instead! Notice that we’re using JSON instead of XML now. This is pretty great with one big exception, No Intellisense. Finally we can access our settings from within our controllers. We’ll be using dependency injection, so if you’re unfamiliar with that, get ready to learn! The class we are injecting is of type IOptions<AppSettings>. If you try to inject AppSettings directly it won’t work. Instead of using the IOptions class throughout the code, instead I set the private variable to just AppSettings and assign it in the constructor using the .Value property of the IOptions class. By the way, the IOptions class is essentially a singleton. The instance we create during startup is the same throughout the lifetime of the application. While this is a lot more setup than the old way of doing things, I think it forces developers to code in a cleaner and more modular way. 1. 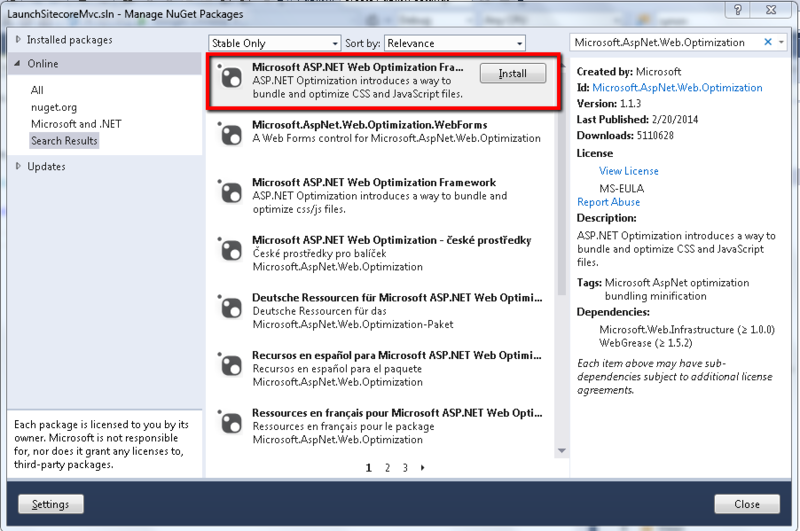 Add Microsoft ASP.NET Web Optimization Framework to your solution from nuget or run the following command in the Package Manager Console to install Microsoft ASP.NET Web Optimization Framework. 3. Register bundle in the Application_Start method in the Global.asax file. If you are using Multi-site instance of Sitecore MVC then recommend way to implement bundling logic is by creating a new processor into the initialize pipeline. We can override the value of the debug attribute in code by using EnableOptimizations property of the BundleTable class. 7. Now compile your solution and verify that bundling and minification is enabled by checking view source of webpage.